Bundesliga | Bayer Leverkusen's Julian Brandt: "I've promised myself that I'll always retain that element of surprise in my game"
Bayer Leverkusen's Julian Brandt: "I've promised myself that I'll always retain that element of surprise in my game"
The thinking man's footballer, Bayer Leverkusen attacking midfielder Julian Brandt is as cerebral off the pitch as he is on it. In a wide-ranging interview with German broadsheet Die Zeit, translated and abridged here by bundesliga.com, Brandt discusses why football is a simple game, his own strengths and weaknesses and recent tactical developments. 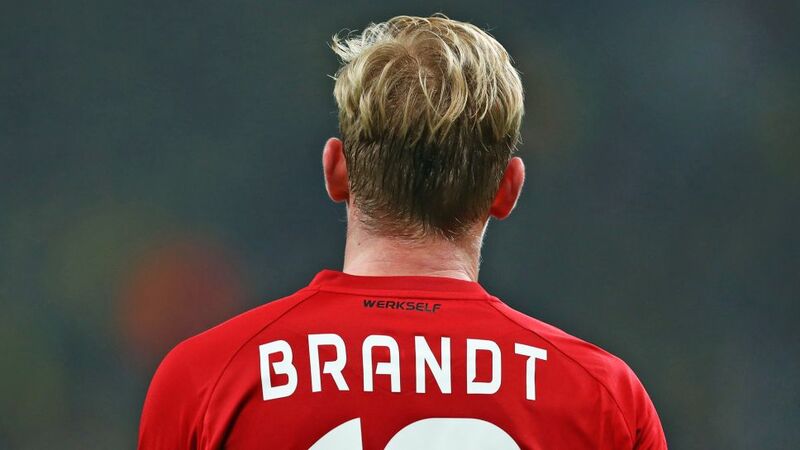 Question: Julian Brandt, is football still a simple game? Julian Brandt: Yes, I'd say so. Perhaps all the experts, those who divide the game up according to statistics or metrics like Packing, will refute me, but at the end of the day the game is still decided by whether you score one more goal than the opposition. At that point, nobody is really interested how many duels Julian Brandt won or whatever. Football is about results. Football is a simple game. Question: What about all the tactical changes in the last few years? Brandt: I've been playing football for more than 15 years and I don’t think too much has changed. Do you? Brandt: I can't think of any one single rule alteration that would have fundamentally changed the game. Perhaps the biggest change for me was going from playing on small pitches to big pitches and switching to 11-a-side football. Of course, as you get older you play with better teammates and against better opposition, so success is harder to come by. But otherwise the game has remained the same: get the ball, put it in the net and win. It's that simple. Question: So you’re not a fan of fiddling about with tactics? Brandt: Tactics are important, because otherwise we'd be playing as we did at under-13 level and all just chasing the ball around. That doesn't make any sense. But for me the most important thing, tactically speaking, is how the coach envisions how you play. You can then use that as a reference point, without becoming obsessed by it. After all, it's we players who are out there on the pitch and football is still all about inspiration, creativity and having fun. Question: Do you think your coach [Heiko Herrlich] sees it in the same way? Brandt: I'm certain that he can understand my point of view. He used to be a player, too! Question: Have you changed in the last few years? Brandt: Very much so. I'd even go as far as to claim that I was a completely different player when I was coming through the youth ranks. I don't need to discuss physical development. Improving physically should be part of the job for every professional footballer, but what I'm referring to is the mental side of the game. I've learnt to think and act faster, but at the same time to stay cool at the decisive moments. Previously, for example, when I took a risk, like a silly dribble, I'd try it again and again. When it worked, everyone cheered; when it didn't, I looked a fool. Since then, though, I've become a lot more secure in possession and in my style of play. I recognise the responsibilities that a player in my position has: not losing the ball and making sure an attack is finished off. Question: Where else have you noticed a positive development? Brandt: Nowadays I'm very pleased with my weaker left foot. I wouldn't call myself two-footed, but I'm getting there. I've also made progress in my peripheral vision, and getting a broader perspective on the game. That's mainly a question of experience, though. In football, he who acts faster gains an advantage. I think in terms of sprint speed I'm probably at my limit. I'm not sure I can do much more on that. But keeping cool in certain situations and sending the right commands to your feet is something you can always work on. Brandt: My return in front of goal. It's tough to simulate outside of a game situation, but you have to try. For example, I set up a few dummies in between the goal that are meant to be marking me. Someone passes me the ball and the aim is to beat the dummies with one touch and then shoot. In a game itself, I still get my head up and look for a teammate too often in such a situation, when sometimes you should just shut your eyes and shoot. So many goals are scored like that! Question: Do you still get nervous before a game? Brandt: Not so much any more. Before my first games I thought a lot about the stands, but since then I've learned to get into my own little world before a game. There could be 20,000 people or 90,000 people screaming, but I wouldn't really pay much attention – a few exceptional situations aside. In my opinion, that's a good thing. When I was starting out, I'd worry about how many people I might disappoint if I made an error. That holds you back. Brandt: I don't think football should be a luxury good. Football should be affordable. If Germany went the way of Italy, where stadiums become emptier and emptier, then I'd find that really sad. At the same time, I'm aware that we footballers live in a bubble and I can't do much about it if fans turn away from football. Whatever happens, the game remains the same, even if the conditions around it change and not everyone might like it. Question: What do you particularly enjoy about football? What fascinates you? Brandt: I like it when a complete love of the game takes over, like when a player does something special, unexpected, slightly instinctive. When you're watching a game and you think you know what’s coming next, but then something happens that nobody had expected. That wow factor that gets you off your seat, That's the reason I play football: to surprise people. I've promised myself that I'll always retain that element of surprise in my game, even in spite of our tactical responsibilities. Question: When was the last time you produced that wow factor? Brandt: Last season, in the 3-0 home win against Eintracht Frankfurt. We were already 2-0 up. There was a long ball in my direction and just before the touchline I managed to beat my marker with a little trick that nobody had expected – I hadn't even expected it myself. It was a little circus trick, really, but I heard the crowd murmuring. The icing on the cake was that I ended up creating the third goal by teeing up Karim Bellarabi, who got the assist [for Kevin Volland]. It was a world-class goal. If the cameras had panned to me, they'd have seen my jumping up and down in the air. I was celebrating the team, celebrating myself, but most of all celebrating this simple game. Click here for more Leverkusen news, views and features!